My choreography is very personal to me. All of the dances I have choreographed through the years have been a reflection of my life experiences. Like many people, I have had some pretty traumatic things happen in my life. Creating choreography has definitely been a form of therapy for me. When I am choreographing a dance, I find it to be a safe place to be vulnerable. It’s a place where I can pour my emotion and the essence of myself into a dance. It sometimes can be physically and emotionally draining to choreograph the stories I tell, but the journey of self-healing that happens when I choreograph is definitely worth it. I have a lot of anxiety and self-doubt every time I start working on a new dance. I have this feeling of dread that when I get in the studio nothing will come out of me, and if something does come out, it won’t be good enough. Usually, when I’m working on a new dance, for the first few rehearsals I feel like I have absolutely no idea what I’m doing. That’s always a scary moment. But I just have to trust my gut and start creating. By the end of the third rehearsal, I start feeling more confident and less out of control. I find the trick is to trust myself, which is something I am always working on. 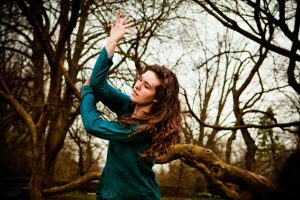 I really delved into the craft of choreography when my sister, Abbey, took her own life in the summer of 2016, after a long struggle with mental illness. She and I had been the closest of companions our whole lives. Having her die so suddenly was paralyzing for me. The next spring, I had the opportunity to choreograph for a show. I remember sitting at a coffee shop with my mom talking to her about how I wanted to choreograph something, but I didn’t know what to choreograph, or even if I was physically and emotionally capable. This was just 6 months after Abbey had died. It seemed to me that the only story I could tell was about my relationship with Abbey. So that’s what I did. I decided that I would tell my story in three parts: the first being Abbey’s and my relationship before her illness, the second about her illness and her death, and the third being the aftermath of it all. It was a very healing experience for me. Most of the dancers that were in the piece had had their own relationships with Abbey. I knew that to create something like this I had to be as honest, vulnerable, and as true as I could be to myself. Creating that dance was the hardest thing I’ve ever done, but at the same time the easiest. When I was creating that dance, it really hit me how important stories are and how crucial they are to any artform. Abbey was a prolific writer and all through our childhood she crammed writing knowledge into my head about screenplay, book, and play-writing structures. It wasn’t until after she died that I realized how similar screenplay writing was to choreographing a dance because they are both visual crafts. This is something that really interests me. I think a lot of crafts are more relatable than we know. When you are choreographing a dance, I think it’s easy to get caught up in thinking, “What would the audience enjoy?” But you might want to ask yourself, “What do I want the audience to witness?” The difference between the two is that “Enjoy” is the crowd pleaser and “Witness” is the deeper stuff inside you, that makes the dance relatable to others, and may or may not, be enjoyable. Both are valid and should be respected. Personally, I try to use “Witness” as much as possible. When a dance is performed, the audience is there to absorb it. So, for that short period of time you have their attention, tell YOUR story, and they can take what is relatable to them and leave the rest. Of course, it’s always nice when your art is well received. But if the art genuinely represents who you are, the audience will hear your voice through the art and respect it. I always try to base my dances on an emotion, relationship, or story that is authentic to me. I try to understand the meaning and depth of my dance, as much as I can, even before I start putting movement to it. I am a firm believer that if you and your dancers know the true meaning of the story behind your dance the audience will know it too, whether you tell them or not. They will feel the emotion and importance of every movement in the choreography. Another gateway for them to feel the emotion in the dance is stillness. When I choreograph, I sometimes get stuck in the idea that there needs to be movement throughout the whole dance, when in reality having stillness gives the audience a chance to catch up with the dancer in the movement and emotion. I think there is so much power in using the element of stillness. There’s something about having the absence of movement in a dance that I find very intriguing and telling of what the story is saying. When you choreograph, be prepared for your story to change. I have found that when I choreograph about my own life, I am processing through something that actually needs to heal inside my soul. As I work through the problem, my dance changes because I am changing. I encourage everyone to create art for themselves that helps them heal their wounds, and have a better understanding of who they are. I am no professional or expert, I am a student and an artist constantly wanting to explore new crafts and new ways to express myself. I wish to grow as a human being and as a storyteller. I hope that my stories can connect to others, and maybe let them know that they are not alone in the struggles that find them on this wandering journey called life.